Since 1959, Destilerías Unidas S.A. (DUSA) has been distilling and blending rums in Venezuela under the name Diplomático, steadily building a reputation as one of the world’s finest producers of the often under-appreciated brown spirit. 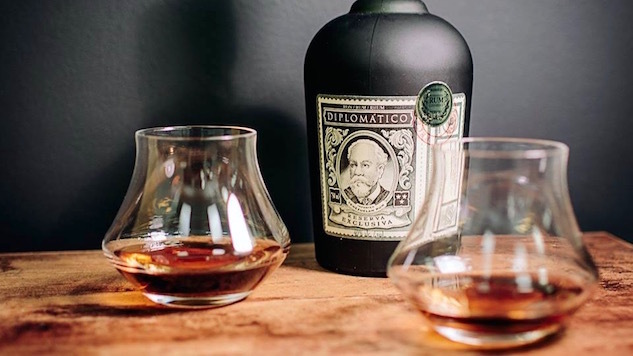 Paste recently had an opportunity to chat with Gilberto Briceño, a master blender at Diplomático, to discuss to state of the rum industry and just why it is the spirit doesn’t seem to get the respect it deserves. Paste: How does one become a master blender? Gilberto Briceno: There are three things that people who want to become a master blender should meet, beyond the technical aspect: patience, passion and good memory. Patience because spirits need real time to evolve and change their natural characteristics during the aging process. Passion because you should love what you do in order to create a wonderful rum. And good memory because progressively you build in your mind a library composed of complex flavors, which will help you maintain the formulas for your rums, and it will also help you create new rums. Paste: Rum doesn’t seem to get as much respect as other spirits like scotch, bourbon, and gin. Why do you think that is? GB: Until not so long ago, rum was typically regarded as a fun and informal spirit, to be mixed with cola or fruit juices, and, therefore, wasn’t really taken seriously. With the recent development of high-end premium rum brands, and all the efforts put forth by these brands into the education of consumers and training of industry professionals, people are starting to better understand the complexity and richness of this spirit category. Nowadays, the production methods employed for premium rum production — and Diplomático Rums in particular — are more rich, complex, and sophisticated than they were in the past. The result is a refined, characterful and delicious spirit that, just as scotch and bourbon, is best enjoyed neat or on the rocks. It has also a versatile profile, what makes it one of the preferred spirits among bartenders, to be used in classic cocktails and original creations. All that being said, rum is often perceived as a more sociable and easy-going spirit as compared to many other brown spirits; and these characteristics are becoming increasingly appealing to scotch and bourbon drinkers. Generally speaking, when people discover Diplomático for the first time they are impressed with the quality and appreciative of the complexity. They know that Diplomático is what rum should taste like. Paste: What is Diplomático doing to stand out? GB: Rum Diplomático is recognized as one of the finest sipping rums in the world, and I believe the reason for this success lies in its unmistakable taste and beautiful aromas. Another characteristic that is specific to our rums and that makes them stand out is their unique distillation process. Diplomático rums are distilled using a variety of methods, including divers continuous columns (Hispanic rum tradition) for light rums, ancient copper pot sills (British whisky tradition) for complex rums, and a batch kettle system (American whisky tradition) for medium-bodied rums. This variety of distillates is what characterizes Diplomático rums and what allows us (master blenders) to create unique blends. The aging of Diplomático rums takes place in different types of casks, predominantly casks that had previously aged bourbon and malt whisky. After the aging process, Diplomático’s prestige expressions, Single Vintage and Ambassador, are placed in the most exclusive Spanish sherry casks for additional time, to provide the perfect finish. We are proud to hold the DOC Ron de Venezuela (Controlled Designation of Origin for Venezuelan rums), which requires that the rum be a rigorously elaborated spirit, made from sugar cane molasses produced in Venezuela, aged in white oak casks for a minimum of two years, and be 80 to 100 proof. Paste: What are your biggest challenges? GB: One of our biggest challenges, as a brand, is to continue growing in the premium-and-above segment, and to do so we must innovate, constantly. We want to continue meeting consumers expectations and surprising them. We are also focused on preserving the extraordinary quality of our rums, and offering the possibility to enjoy Diplomático Rum in different ways. Paste: What should people be looking for when tasting rum? What factors should they be aware of? In other words, what makes for a truly great rum? GB: Rum is a very special spirit, and what consumers should be looking for is one that they can enjoy neat or in elegant cocktails. The notes of a very good rum are the ones that remind of sugar cane, fruity aromas (mainly citric), honey and some woodiness. On the palate, the rum should be rich, complex, round and well balanced. The flavors must be present in the mouth for as much time as possible, which is indicative that the rum is a good one, and that it was really aged for many years. To me, a good rum is the one that invites the consumer to drink it again, one that builds loyalty with just one sip. A good rum is the one the consumer enjoys so much that he/she wants to share it with friends either for a special celebration or a casual get-together. Because that’s what Diplomático Rum is about: sharing great moments! Tasting notes: Dark gold in color; aromas of plum, oak, nuts, vanilla; flavors or dried fruit, wood, vanilla. Directions: Combine ingredients with ice in a mixing tin, and shake. Strain over fresh ice into a rocks glass or serve up in a coupe. Garnish with a lime wheel. Tasting notes: Clear; aromas of vanilla, cream, coconut, oak; fruity with notes of dry coconut, mocha coffee. Directions: Combine ingredients with ice in a mixing tin and shake. Strain into a chilled cocktail glass. Garnish with a lime wheel. Tasting notes: Amber color; aromas of maple syrup, orange peel, licorice; flavors of toffee. Directions: Combine simple syrup and bitters in a tumbler and swirl to coat the glass. Add ice and rum then stir. Garnish with an orange peel. Tasting notes: Deep golden amber; spicy with aromas of caramel, vanilla, almonds, dried fruit; flavors or caramel, vanilla oak, nutmeg, tobacco, dried apricots.